finally, some stuff in my shop! 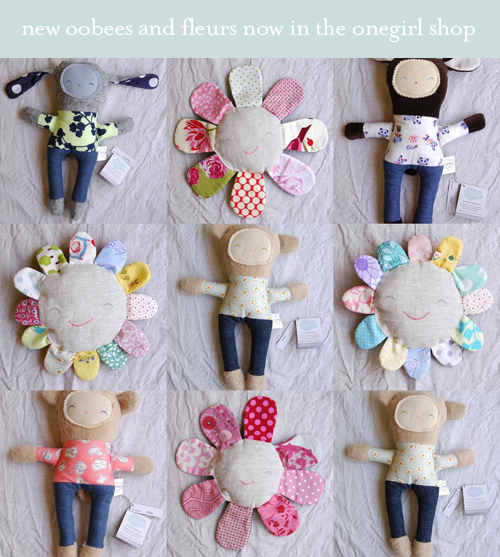 there are oobees, well dressed oobees, fleurs and one lone special edition oobee bunny available. i'm going to try and whip up a couple more oobee bunnies in the next day or so, so that anyone who wants a little easter treat gets a chance to nab one. and i'm back to taking custom orders so let me know if there is something your little heart desires (not implying that any of you, my lovely blog friends, have little hearts). prices shown in the etsy shop are in US dollars but i can offer australian pricing to aussies paying by direct deposit so send me an email for details. i have quilts available, too - oh, i have quilts available! i got FIVE custom quilt orders between the two shows but did not sell one single quilt i had ready to go so i need to decide which i'm going to list, how i'm going to photograph them and how much international and local shipping will be. i want to keep a couple of them on hand as i was invited to participate in the magnolia square tiny & small event in may, which i'm super thrilled about, and with the custom orders i may not have time to make new ones. alrighty, back to the sewing room with me, hope you've all had a lovely weekend! Hi! I arrived here from vince design & letterpress. Your work is as beautiful as ever and the show looks like it was a lot of fun! The 'loot' from all your swaps is amazing! Leslie, I'd love to have a chat with you at some stage about the Stitches and Craft show. They've invited me to be a part of something called an indie incubator for the next show in Sydney. I'm wondering if it is worthwhile. I'd love to know your thoughts.